Decorating Jude's blue striped Beatles themed nursery with painted black and white horizontal Stripes took lots of patience! To perfect the wall painting technique I used a laser level and taped out one of the nursery walls at a time. The baby's room has 12' ceilings, so painting stripes at that height that was a blast as you can imagine. We considered a rock and roll nursery theme as well as a musical note nursery theme but the Fab Four won out! The black crib, changing table and cabinet had been used by another family and were all a light colored wood which didn't work with our color scheme. I sanded all of the pieces down and then primed and painted everything again to achieve this new, beautiful finish. We found a picture of the The Baby Beatles painting online and my wonderful, creative wife recreated it on canvas for our little guy (YES this is an actual painting!). 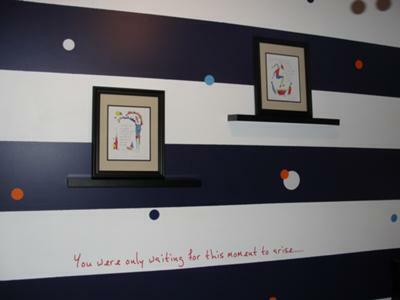 The lyrics that we chose to use to decorate the walls are from the Beatles song "Blackbird" ("You were only waiting for this moment to arise") and the John Lennon song "Imagine" ("You may say that I'm a dreamer, but I'm not the only one"). We ordered these custom decals from a website. 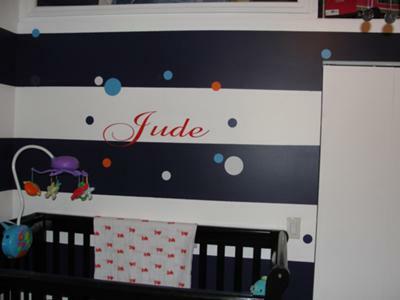 We also ordered the vinyl sticker with baby nursery wall letters spelling his name above his crib from this site at the same time we ordered the decals with the song lyrics. Brian Andreas is one of our favorite artist/authors. The titles of the two art prints that we chose to buy from his collection are "Such Small Things" and "His Laughter". Jude is one lucky baby boy to be surrounded by such a beautifully decorated Beatles nursery theme filled with love and some of the most inspiring words of our time. And....it did not escape me that your name is John! So many new parents that are Beatles fans have expressed their need for Unique Baby Gear and Nursery Ideas that were more subtle than a psychedelic Yellow Submarine theme but more indicative of the Beatles culture than the John Lennon baby bedding sets. I believe that they are going to love Jude's Beatles nursery theme!